When he heard this, Jesus said, "This sickness will not end in death. No, it is for God’s glory so that God’s Son may be glorified through it.” Now Jesus loved Martha and her sister and Lazarus. I've been reading a novel where the main character flees from her abusive husband. Here's the kicker—the husband who physically, mentally, and emotionally abuses her, says he loves her. The story breaks my heart, but thanks to God, she's surrounded by friends who love her and help her. Even though this is fiction, the story resonates with truth. 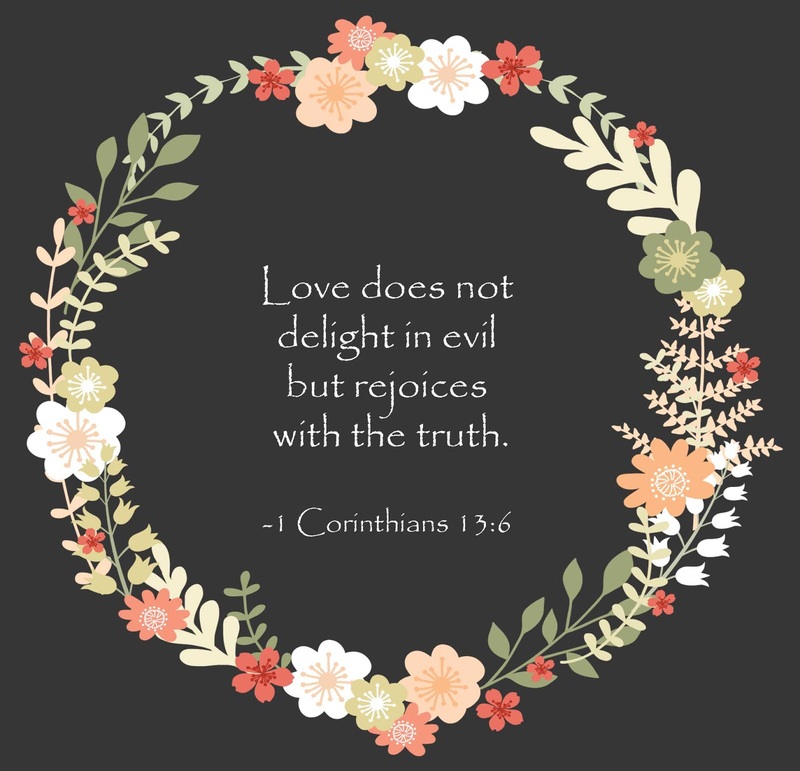 People say they love others, but is the love reflective of evil or God's truth? Does the "best friend" gossip behind her BFFs back? Maybe a sibling's anger over who-knows-what creates an uncomfortable situation. I could go on, but I think you see where I'm heading with this. The love I have for my spouse, my children, my parents, my siblings, my friends, my church— must rejoice in truth. Just like Jesus loved his family and friends. In the book of John, we read about Jesus raising Lazarus from the dead. Jesus could have said, "sorry sisters, I can't do a thing to help out Lazarus." He could have left them to mourn their brother. But instead, Jesus went to them and healed his friend who he loved. He rejoiced in the truth that Lazarus' restored life brought glory to God. Life brings choices. Decisions on how I treat the people I'm called to love. Do I belittle them to make myself look better? Do I yell at them? Do I ignore their needs? Or do I reach out to them as Jesus did, with love? 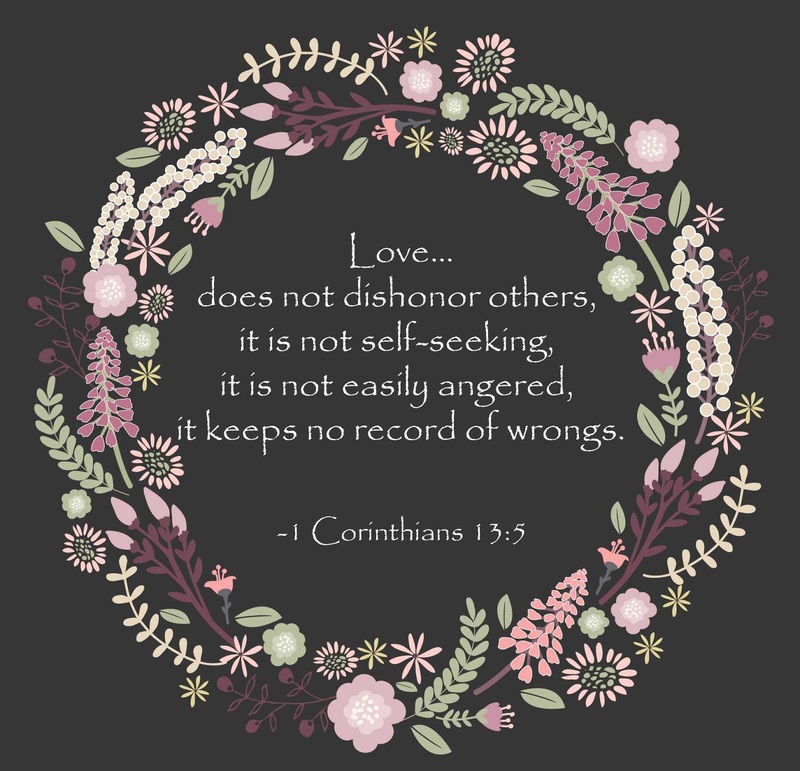 Love...does not dishonor others, it is not self-seeking, it is not easily angered, it keeps no record of wrongs. As a mom, I didn't always have the best discipline methods. One time my three girls were doing what siblings sometimes do, arguing. Who knows what the squabble was about, probably something trivial, but it ended with name calling. Frustrated, I wanted to end the quarrel. So instead of telling them to stop, or sitting them down to discuss their behavior, I yelled out, "Let's just...call each other names." Well that stopped the fight, all right. All three of them busted out laughing...at me. So maybe it wasn't the best method, but it worked. You see, I hate name calling, especially among loved ones. When we love someone like Jesus loves, there is no place for rudeness, selfishness, quick anger or grudges. Think about it, these are the people we love. We've chosen to love our spouses, our family, our friends, our church. I'm not just talking about the call to love all people. I'm talking about the love we have for those who are dear to us. When I think about Jesus and the love he has for me, I am humbled to my knees. He gave his life for me and you. Like Jesus, I aim to value the people I love. My daughter sent me a meme recently that fit me like a snug mitten. The photo was a person in a knit hat and winter coat. lover of cold weather, snow. a person who finds joy and peace of mind during snowy days. I love winter. There I said it. I know many people think I'm crazy. But, I truly find peace and rest when the snow blankets the yard and piles up in my flower bed. I enjoy watching the flakes dance from the clouds. When the sun shines on them, they twinkle like Christmas lights. We've had freezing temperatures in Ohio. The first time in probably three years. And yes, I'm excited. I don my purple boots, heavy socks, gloves and red scarf, and I'm delighted. I love winter clothes and dressing in layers. But what I enjoy the most about winter is the quiet. We took a road trip to Marblehead, yesterday. Lake Erie is frozen. Ice piled high along the rocks and snow covered the ground. There were a few other people out enjoying the cold. But the one thing I noticed was the absolute quiet. No waves crashed on the rocks. 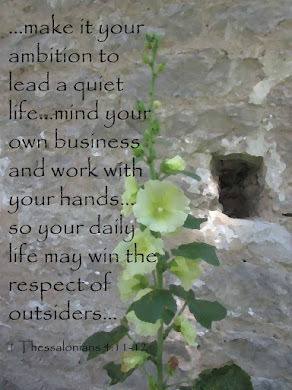 People whispered. The wind stood still. We tossed small pieces of ice onto the frozen lake and we could hear them skitter. Peace covered me. I stood amazed at God's creation. I never want winter to hamper others or cause difficulty. But while I can, I'm enjoying the beauty and peace of winter. 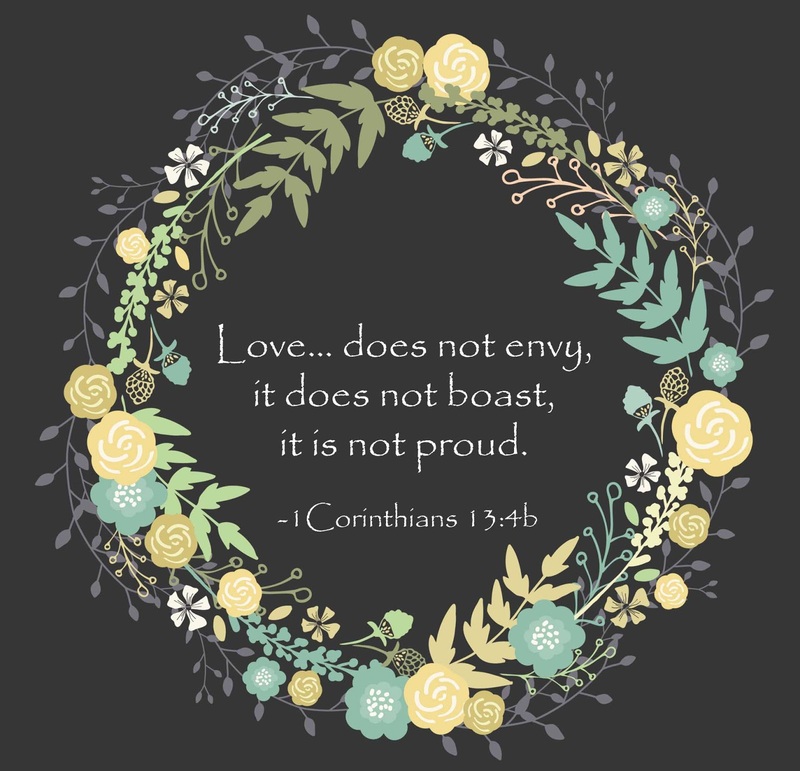 Love...does not envy, it does not boast, it is not proud. As I've considered what 1 Corinthians 13:14b means to me, I've thought about the times in my life when I've felt jealous. I'm not talking about when I was young and envied, Partridge Family actress, Susan Dey's flowing hair. 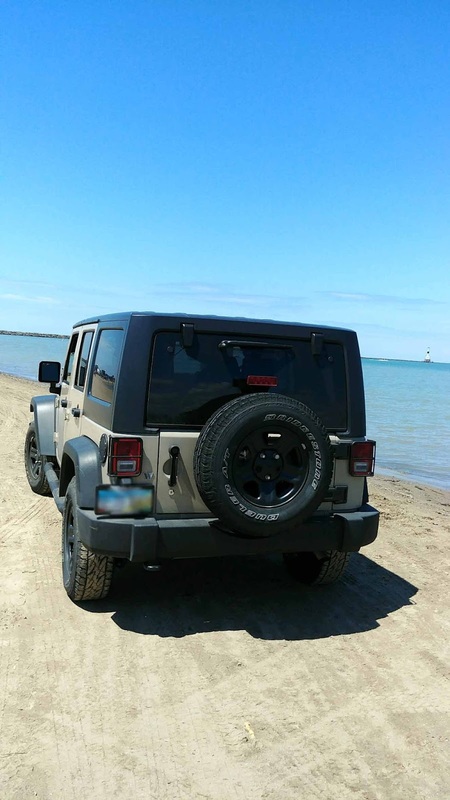 Or the times I'd see a Jeep and wish it was mine. No, this is more personal. I'm talking about the times I've envied people I love. The ones who mean the world to me. Envying someone I don't know is one thing, but being jealous of someone I love is personal. Jealousy or envy promote bitterness and selfishness. If you've ever envied a friend or family member, a switch flips and a protective mode pops up. You begin to boast about your life to cover up your flaw of jealousy. Sound familiar? It does to me. This is neither wise nor humble. In love, Jesus wants us to support each other. He calls us to rely on Godly wisdom and encourage each other. God's love results in peace. This week I pray, I will promote peace through love. Patience is required for many life moments. I know my patience has stretched like Silly Putty until a hole poked through the center. As I've prayed on and thought about patience in the context of love this week, the example that keeps popping into my head involves a baby. Not a particular one, could be any little one who can't feed themselves, yet. To set the scene—I've buckled the child in the highchair, and I'm preparing a yummy jar of smooshed up green beans. (You know, the ones with no flavor that are a putrid green.) I've warmed them in a pan of hot water, because I don't want to overheat them. I stir and check the temp, several times. The whole time I'm stirring, I'm also entertaining my little one, so she doesn't cry. Finally, the temperature meets my expectations. I sit down in front of my sweet, little dear and spoon up the first bite. She opens her mouth like a baby bird and takes the spoonful. When I aim the second bite at her mouth, she closes her lips tight and refuses to eat. So we play the airplane game. "Here comes the plane. Vroom." And it sails by those pursed lips. Until finally she open her mouth again, takes a bite, remembers how bad it tastes, and without warning, spits it all over my face. Do I give up? No, I clean myself up and try again. That, my friends, is patience. 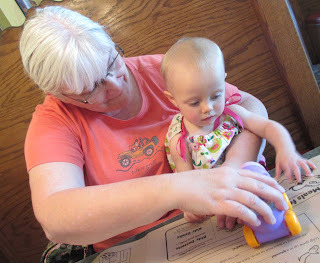 I want the baby to eat a healthy meal, so I keep trying. 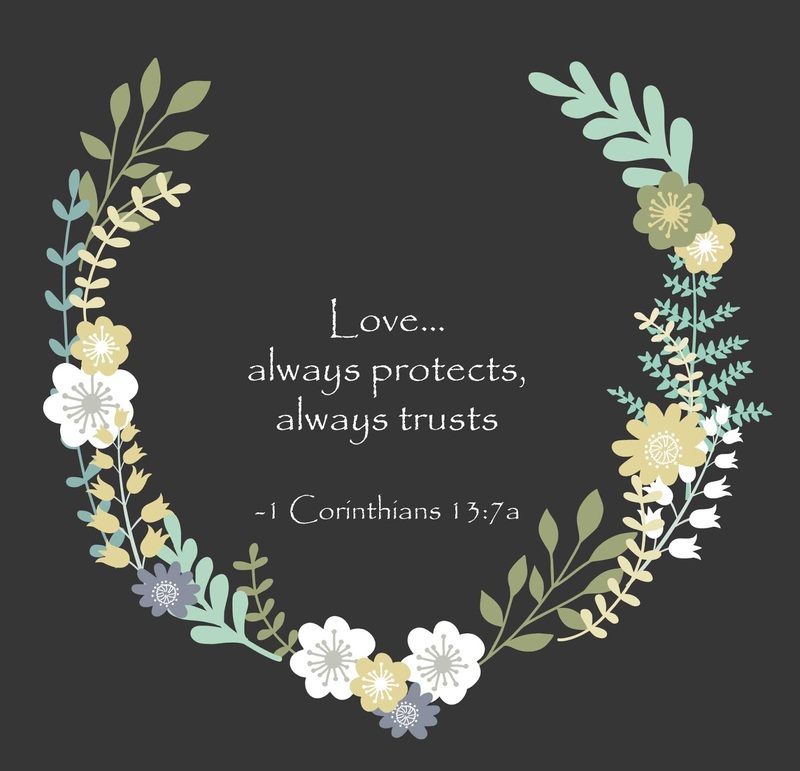 God wants me to nurture the kind of love that requires patience. According to Proverbs, someone who is patient is understanding and has wisdom. In the thesaurus, another term listed for patience is "lack of complaint." When Jesus chose the twelve disciples to leave their livelihoods and follow him, I'm certain he understood how much patience he would need. He knew Peter would deny him, Thomas would doubt him, and Judas would betray him. Yet, he still loved them with patience and kindness. 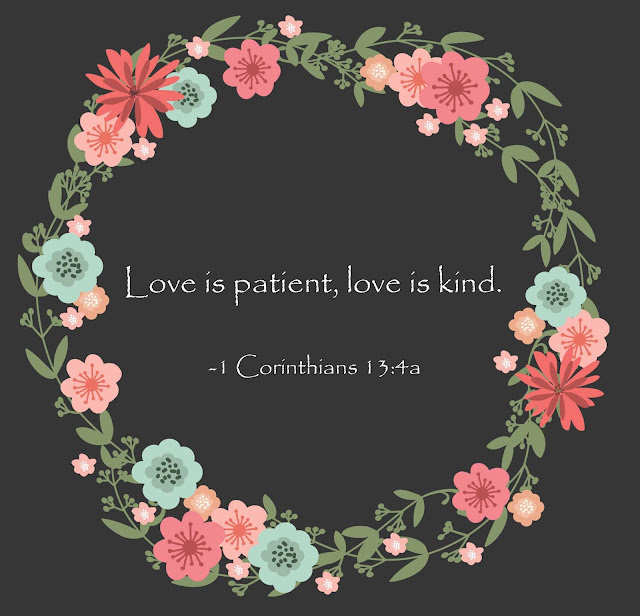 I wonder if Paul, the author of Corinthians, listed patience first in the traits of love, because it is one of the most difficult to develop. In our society, patience is not a virtue, but it needs to be. As believers in Jesus, we need to cultivate the courage to love with a patient heart, the way Jesus did. When has your patience been tested?